If I EVER read another blog post on work / life balance I might gag. Yes, we all know that we should try to work less, and have fun more, right? But Wii often miss that Wii not only need to spend time “not working”, but Wii need to spend time purposely “having fun.” In my motivational keynote speeches I encourage people to play and “Act Happy.” It’s one of those Fake it Until You Make it Strategies. And it works. My point? Pick something NOW that gets you physically involved in creatingf joy, fun or levity. It might be as simple as leaving a crank phone call for a pal, taking your dog for a walk, or stealing the neighbor-kid’s Wii for a couple of hours. What are you doing today to physically get involved in creating fun? Come one! DO SOMETHING! Leave a comment…. do you think this works? Need a funny speaker who can inspire your group (with or without video games?) Go to the contact page. Happily, it went well. Really well. It was a terrific group. The best part of the motivational speech for me was watching these men and women change during our time together. Predictably, they started out pretty wary. “What?! A funny motivational speaker at a military conference?” But after the first few minutes they began to relax and get into it — and to laugh. It was clear to me — even as an outsider — that this group NEEDED to laugh. Does your group (military or civilian) need a speaker who can help them with perspective, morale and attitude? Wouldn’t it be cool if this motivational speaker was funny? I think so too. Let’s talk. Go to the contact page. Video of some of my work on YouTube as a magician. https://www.bradmontgomery.com/wp-content/uploads/2018/11/logo-1-495x198-1-300x120.png 0 0 admin https://www.bradmontgomery.com/wp-content/uploads/2018/11/logo-1-495x198-1-300x120.png admin2009-04-23 00:06:562016-11-03 22:15:19Our Dept. of Defense Needs to Laugh. Now! improve their bottom line. I know it. And you know it. Humor + work = improved bottom line. What amazes me is how United Airlines and the other struggling airlines are the only ones NOT learning from Southwest. Corporate espionage would never be so easy: United should put a single employee on a Southwest flight, have them notice how the fun attitude of the employees translates to customer satisfaction, and then…. copy them! No cloak and daggers needed. It’s not even stealing. It’s just common sense. I was just on an United flight and was chatting with a flight attendant about the safety announcements, and whether she thought humor was appropriate. I’m not at all sure what the “official” policy is, but her understanding of it is that fun is NOT encouraged… or allowed. And she shared some anecdotal evidence about her UAL peers getting chewed out for trying to make the safety demonstration fun. Hmmph. Oh, and guess how her morale was? Yeah, lousy. She is a nice woman, but her loyalty to her employer and her customers ends at her paycheck. I live in Colorado… and as it is a hub for United I fly them a lot. An awful lot. An AWFUL lot. I’m stuck with them. But I don’t like them. It’s clear to me that their employee morale is rock bottom. They are worried for their jobs and future. 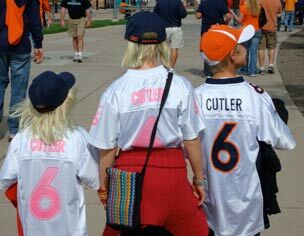 They don’t feel like the carrier is on their side. And their employee dissatisfaction comes through loud and clear to folks like me. Their customers. I have dozens of stories about how United could have easily earned my loyalty but instead made my life harder. It’s too bad. Especially because it doesn’t have to be that way. They need — to be frank — me. Bad. Really bad. But they’ll never hire me to talk to their staff with ideas about how to connect enjoyment of their jobs to creating an outstanding airline. They haven’t noticed that the ONLY thing that sets them apart from their competitors is their people. And their people are unhappy. Very unhappy. Just ask that flight attendent. Does YOUR company need to invest in your people’s quality of (work) life? Do you agree that NOW is the time to make sure they are at their best, because you simply cannot afford a staff that isn’t fully on board? Go to the contact page and let’s talk about how to ramp up your groups attitudes and loyalty, and how that will create a great impact on your bottom line. Do you need to ramp up the attitude in your organization? You don’t even need to sing. Contact us now! Go to the contact page. everybody in the football organization except for the coaches and players… a surprisingly huge group. One of the most delightful sentences I heard from them when we talked about my fee was, “Would you be interested in bartering for a portion of your fee?” Heck yeah, I love that question! 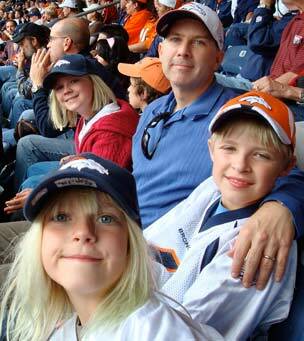 couple of games, and dressed my wife and kids and I in a ton of Bronco’s swag. Jerseys, sweatshirts, hats… the whole thing. It was a blast. What’s my point? If you’re booking motivational speakers and have something to trade, ask! Perhaps you’re a hotel property, or you make fancy furniture, or…. you’re a professional sports franchise. You might not be able to barter away the entire fee. 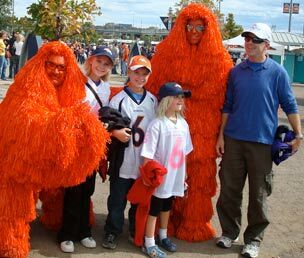 But, like the Broncos, they got an easy discount and I was thrilled to trade. wildly because what I offer my clients flexes wildly depending on what outcomes they are after and how serious they are about lasting change. But one thing is certain: barter is cool. It’s fun. And if often makes sense for both of us. Not sure if it is for you? Just ask. Are you looking for motivational keynote speakers? Care to barter? Or not? I’d love to be your guy. Go to the contact page. https://www.bradmontgomery.com/wp-content/uploads/2018/11/logo-1-495x198-1-300x120.png 0 0 admin https://www.bradmontgomery.com/wp-content/uploads/2018/11/logo-1-495x198-1-300x120.png admin2009-04-13 22:07:382009-04-13 22:07:38Care To Barter for a Motivational Speech? Farmington Schools recently hired me to motivate their administrators. We brought them together for one huge team-building, morale-building, humor in the workplace fiesta. Ok, seminar is the proper term, but hey, “fiesta” sounds like better marketing. We did Laugh-O-Nomics: my session for folks who really wan to create lasting change in their work culture. Are you looking for a motivational speaker for your school district? Want to inspire and motivate your staff, your classified staff or your administrators? I’d love to be your guy. The main take away for me: I was struck with how important it is to these educators to make their job fun. They were craving both tools and techniques for bringing levity and lightheartedness to the workplace AND permission to use them. In other words, one of the biggest things I provided by being there was encouragement and permission to bring the concept “enjoying ourselves at school will help us with our mission as educators” to each of these fine educators. Many of them new HOW to lighten up; they just had forgotten how important it was both to them AND to the superintendent. Learn more about this educators speaker here. Education Speaker, New Mexico Speaker, Fan of Farmington! I was just at speaking for the USDA Farm Services group in South Dakota. This letter is a strong endorsement of speaker Brad Montgomery. I talked Brad up big to our people; I was looking for a home run. Brad was even better than we hoped. Our organization is going through many changes, and our people needed a boost to help them through these changes. And if your organization is anything like mine, you know that creating behavior and attitude change is harder than it sounds. Brad spoke to a large portion of my group responsible for making millions of dollars worth of loans. I’m glad he did; he made a difference. His program was a total success. In the days following Brad’s appearance, I got surprisingly many positive comments. (They loved him!) But also, I heard anecdotal evidence of Brad’s impact on morale, attitude, and my people’s ability to tackle some of our organizational changes. In other words, Brad did more than motivate, inspire, and make us laugh. (Though he did all of those things exceptionally well.) He helped get our people back on track, ready to work, and ready to move where we need to go. If you are looking for a speaker who will be the highlight of the conference AND help your organization with specific ways to improve morale and attitude and increase organizational productivity, Brad Montgomery is a perfect choice. I recommend him without reservation. Hire him; you’ll be glad you did. Thanks So Much USDA! I had a blast in South Dakota! Are you looking for a speaker for your meeting or convention. Go Here To Contact Me. https://www.bradmontgomery.com/wp-content/uploads/2018/11/logo-1-495x198-1-300x120.png 0 0 admin https://www.bradmontgomery.com/wp-content/uploads/2018/11/logo-1-495x198-1-300x120.png admin2009-04-08 12:25:172016-11-01 08:32:21USDA in South Dakota? You Bet! Wondering how to be a comedian? Do you want to know how to be a funny motivational speaker? Here is your answer. I am so proud of this project. 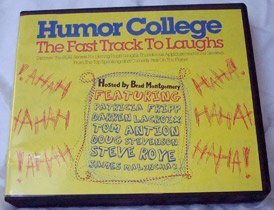 Humor College was a series where I interviewed some of the top speakers and comedians around and asked them: How can we be funny like you? It was one of those astounding projects where I learned at least as much as I taught. Thanks to all of you who already have taken part in the College. And for the rest of you, if you are interested in learning how to be a motivational speaker, or how to be a comedian…or you just are looking to punch up the humor in as one of the tools in your presentation skills tool box, I invite you to consider the college. Hype aside, I’m proud of the project, I’m proud of the result, and I’m proud to be part of it. If you’re looking to ramp up the funny in your presentation skills, if you want to learn how to be a comedian, if you are NOT funny at all and want to learn how to safely and EASILY use humor in your programs, then you’ll want to check these CDs out. Thanks again to all of the Humor College graduates. Congrats! This little blog of mine is a winner of the Blog of the Day! Always nice to have others give you an “Attaboy.” Very cool. Thanks Kids! And thanks for the nomination. https://www.bradmontgomery.com/wp-content/uploads/2018/11/logo-1-495x198-1-300x120.png 0 0 admin https://www.bradmontgomery.com/wp-content/uploads/2018/11/logo-1-495x198-1-300x120.png admin2009-04-05 21:42:192016-11-03 07:35:51This Blog Won!